Over the past few years, I’ve written quite a bit about Mark Lanegan, the Ellensburg, WA-born, Los Angeles, CA-based singer/songwriter and guitarist, who is best known as the frontman, and founding member of Seattle-based grunge rock pioneers Screaming Trees, and for collaborating with an incredibly diverse array of artists and bands throughout his lengthy career, including Nirvana’s Kurt Cobain on an unreleased Lead Belly cover/tribute album recorded before the release of Nevermind; as a member of the renowned grunge All-Star supergroup/side project Mad Season with Alice in Chains‘ Layne Staley and Pearl Jam‘s Mike McCready; as a member of Queens of the Stone Age featured on five of the band’s albums — 2000’s Rated R, 2002’s Songs for the Deaf, 2005’s Lullabies to Paralyze, 2007’s Era Vulgaris and 2013’s . . . Like Clockwork; with The Afghan Whigs‘ Greg Dulli in The Gutter Twins; as well as former Belle and Sebastian vocalist Isobel Campbell on three albums. Additionally, Lanegan has contributed or guested on albums by Melisa Auf der Maur, Martina Topley-Bird, Creature with the Atom Brain, Moby, Bomb the Bass, Soulsavers, Greg Dulli’s The Twilight Singers, UNKLE and others. While developing a reputation for being a highly sought-after collaborator, Lanegan has also managed to maintain a solo career that has seen him release ten, critically applauded and somewhat commercially successful albums; in fact, ironically, his solo work has seen more commercial success than his work with Screaming Trees. Lanegan’s tenth solo album, 2017’s Gargoyle found the Ellensburg, WA-born, Los Angeles, CA-based singer/songwriter and guitarist collaborating with British-based musician Rob Marshall, who’s best known for stints with Exit Calm and Humanist and his longtime collaborator, multi-instrumentalist and producer Alain Johannes. Sonically speaking, the material was both a refinement and an expansion of the Krautrock-tinged blues of his previous two albums Blues Funeral and Phantom Radio. Duke Garwood is a British-based blues/indie rock multi-instrumentalist and singer/songwriter, who has written and released six albums as a solo artist — 2005’s Holy Week, 2006’s Emerald Palace, 2009’s The Sand That Falls, 2011’s Dreamboatsafari, 2015’s Heavy Love and 2017’s Garden of Ashes. He’s also collaborated with renowned The Orb, Archie Bronson Outfit, Savages, Shezad Dawood and the aforementioned Mark Lanegan among others; in fact, Garwood has released an album with Lanegan — 2013’s Black Pudding and as has recorded and toured as a member of Lanegan’s backing band for the renowned grunge pioneer’s last three albums. Interestingly, Garwood and Lanegan continue their ongoing collaboration with their forthcoming, second album together With Animals, which is slated for an August 24, 2018 release through Heavenly Records, and the album, which was split between old-fashioned studio collaboration and Trans-Atlantic file sharing is a decided sonic departure for both artists, as it finds them crafting spectral and sinewy music, focusing on the spaces between notes while employing much different instrumentation — dusty, analog synthesizers and drum machines. The album’s first single, the sparse, mournful and aching “Save Me” is centered around Lanegan’s imitable vocals, fluttering, synths and metronomic drum machines, and in some way the track sounds like a discarded remnant of life just before the apocalypse; but underneath, the song feels made of some older stuff, as though it channels an ancient pagan ritual. As Harwood says of his lengthy collaboration with the renowned grunge pioneer, “Over the years, we’ve recorded together and apart. This time, I started this record alone with many animals as company. It flowed, I set to work and out it came. Our music is instinct, there is not much talking about it, just creating. I think that if you are at peace with your work, and feeling it right, it flows, and can feel ‘easy’. Music isn’t meant to be hard. Though sometimes it can burn you to ashes. Making music for a singer, so they can inhabit it with a song means hitting the right soul buttons. There is no hit without a miss. It is a healing record, for us the makers, and for the listeners. It grows natural. We are gardeners of sonic feelings. The recently released video features footage of 80s wrestlers but in heavily filtered negatives, which further emphasizes the song’s trippy vibes. Mark Lanegan is a Ellensburg, WA-born, Los Angeles, CA-based singer/songwriter and guitarist, best known as one of the founding members and frontman of renowned Seattle-based grunge rock pioneers Screaming Trees, and as a solo artist who has collaborated with an incredibly diverse array of artists and bands throughout his lengthy career including Nirvana‘s Kurt Cobain on an unreleased Lead Belly cover/tribute album recorded before the release of Nevermind. Along with that Lanegan is also known for being a member of the grunge rock, All-Star supergroup/side project Mad Season with Alice in Chains‘ Layne Staley and Pearl Jam‘s Mike McCready and for joining Queens of the Stone Age after the breakup of Screaming Trees, contributing on five of the band’s albums — 2000’s Rated R, 2002’s Songs for the Deaf, 2005’s Lullabies to Paralyze, 2007’s Era Vulgaris and 2013’s . . . Like Clockwork. Lanegan has also collaborated with The Afghan Whigs‘ Greg Dulli in The Gutter Twins and has collaborated with former Belle and Sebastian vocalist Isobel Campbell on three albums. Additionally, he has contributed or guested on albums by Melisa Auf der Maur, Martina Topley-Bird, Creature with the Atom Brain, Moby, Bomb the Bass, Soulsavers, Greg Dulli’s The Twilight Singers, UNKLE and others. As a solo artist, Lanegan has released 10 studio albums that have been critically applauded and have seen a fair amount of commercial success. Interestingly, the music Marshall had written had managed to fit perfectly with the direction Lanegan had been thinking of for some time — an expansion of the Krautrock-inspired electronic sounds and textures of his previous two albums Blues Funeral and Phantom Radio. Eventually Marshall wound up co-writing six of the album’s 10 songs with the remainder of the album being written and produced by Lanegan’s longtime collaborator Alain Johannes at 11AD Studios in West Hollywood. Gargoyle‘s second single “Beehive” pairs Lanegan’s imitable boozy, growling baritone vocals with a bluesy and swaggering production featuring shimmering guitar chords and enormous tweeter and woofer rattling beats, essentially pushing Lanegan’s recent forays into the blues into the 21st Century; but in a way that feels both warmly familiar and yet new. Gargoyle’s latest single “Emperor” finds Lanegan and his backing band pairing Lanegan’s imitable, boozy and growling baritone with the sort of old-timey, bar room blues that brings to mind Iggy Pop’s “The Passenger,” complete with jangling and shimmering guitars and a propulsive backbeat; but much like its predecessor, the song possesses a weary and existential weariness just underneath the surface. The recently released video continues a string of cinematic yet surreal visuals — in this case, the viewer is thrown into a vaguely Russian styled dictatorship, full of state sanction violence upon innocent people while also nodding at Julius Caesar. While being fictional, the video manages to evoke our dangerously strange and uncertain times. Mark Lanegan is a Ellensburg, WA-born, Los Angeles, CA-based singer/songwriter and guitarist, best known as the frontman, and founding member of Seattle-based grunge rock pioneers Screaming Trees, and for collaborating with an incredibly diverse array of artists and bands throughout his lengthy career including Nirvana‘s Kurt Cobain on an unreleased Lead Belly cover/tribute album recorded before the release of Nevermind. The Ellensburg-born, Los Angeles-based singer/songwriter was also a member of renowned grunge rock All-Star supergroup/side project Mad Season with Alice in Chains‘ Layne Staley and Pearl Jam‘s Mike McCready. After Screaming Trees broke up in 2000, Lanegan joined Queens of the Stone Age and is featured on the band’s last five albums — 2000’s Rated R, 2002’s Songs for the Deaf, 2005’s Lullabies to Paralyze, 2007’s Era Vulgaris and 2013’s . . . Like Clockwork. He’s also collaborated with The Afghan Whigs‘ Greg Dulli in The Gutter Twins and has collaborated with former Belle and Sebastian vocalist Isobel Campbell on three albums. Additionally, he has contributed or guested on albums by Melisa Auf der Maur, Martina Topley-Bird, Creature with the Atom Brain, Moby, Bomb the Bass, Soulsavers, Greg Dulli’s The Twilight Singers, UNKLE and others. And although he’s managed to be rather busy throughout the years, Lanegan has also developed a low-key solo career in which he’s released nine studio albums that have been critically applauded and have seen a fair amount of commercial success. 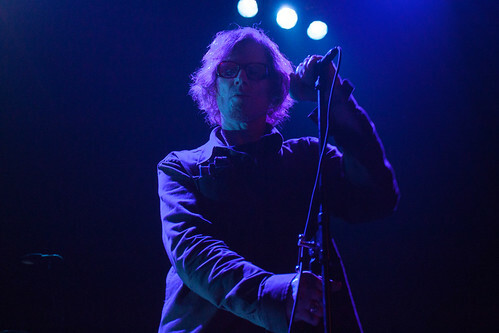 Early on in the writing process, Lanegan had written “Blue Blue Sea,” a rippling mood peice that he thought and felt would be more fruitful direction for the songs on the album. “It’s almost always how my records start,” the Los Angeles-based singer/songwriter explains in press notes. “I let the first couple of songs tell me what the next couple should sound like, and it’s really the same process when I’m writing words. Whatever my first couple of lines are, tell me what the next couple should be. I’ve always built things like that, sort of like making a sculpture I guess.” Within about an hour, Lanegan and written words and recorded vocals for two of the instrumental tracks Marshall had written and recorded at Mount Sion Studios in Kent UK. Interestingly, the music Marshall had written had managed to fit perfectly with the direction Lanegan had been thinking of for some time — an expansion of the Krautrock-inspired electronic sounds and textures of his previous two albums Blues Funeral and Phantom Radio. Eventually Marshall wound up co-writing six of the album’s 10 songs with the remainder of the album being written and produced by Lanegan’s longtime collaborator Alain Johannes at 11AD Studios in West Hollywood. Gargoyle‘s second and latest single “Beehive” pairs Lanegan’s imitable boozy, growling baritone vocals with a bluesy and swaggering production featuring shimmering guitar chords and enormous tweeter and woofer rattling beats, essentially pushing Lanegan’s recent forays into the blues into the 21st Century; but in a way that feels both warmly familiar and yet new. Directed by Zhang + Kang and produced by Agile Flims, the recently released video for “Beehive” follows two young lovers — two vampires, actually, who are desperately trying to kick their craving for blood. Before presumably deciding to kill themselves, they spend a sad yet beautiful romantic night together — and at the core of the video is a heavy, world-weary and fatalistic ache.